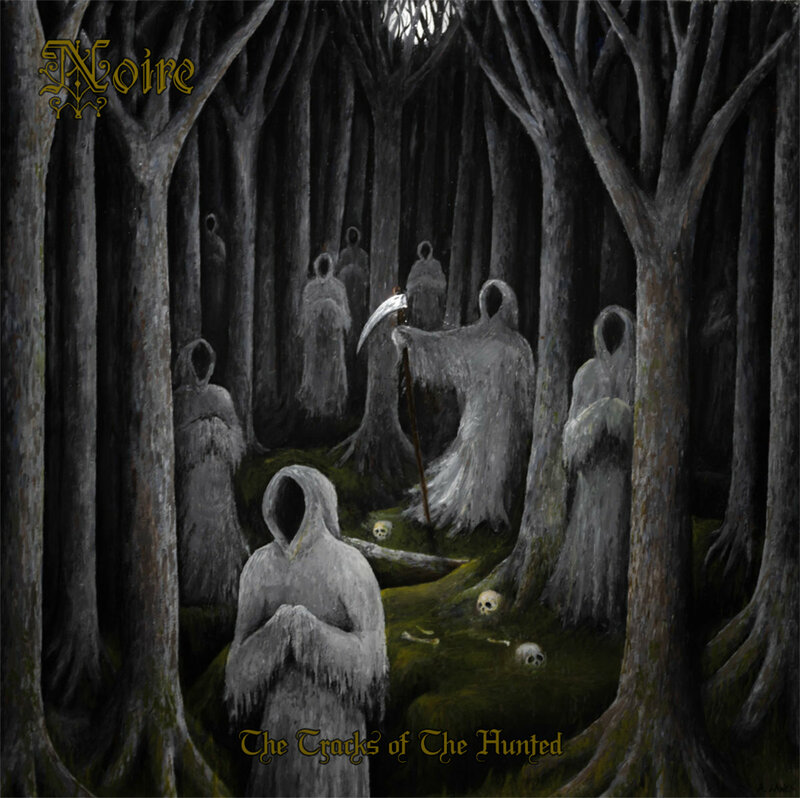 Noire is a self-described progressive black metal band from Winnipeg, Manitoba, and until recently, I had never heard of them (this was rectified, as most of my musical ignorances are, by the good folks at No Clean Singing, at which point I immediately fell in love with the cover art). Shortly thereafter, the band's new EP The Tracks of the Hunted showed up in the ol' Töp inbox, and I gave it a listen. I then immediately wished it was 40 degrees colder, overcast, with a frigid arctic wind chilling me to the bone, because that weather would fit the music on The Tracks of the Hunted so much better than this silly summer sunshine. The Tracks of the Hunted kicks off with "Piano Intro," which is an as honestly titled track as I've ever heard. The piano is grand, bombastic, and deeply mournful while also supremely beautiful and regal. It sounds like something that would be at home in a gothic romance story (in the literary sense; think Frankenstein). "Eternity" functions as the first proper song on the EP, but it stays true to the atmosphere established in "Piano Intro." Acoustic guitars flourish and dance around one another, embracing a sense of strangeness and wonder... until muted screams begin to emerge in the background, unseen victims of something heinous, wailing from deep inside the ambient fog Noire creates with nothing more than acoustic guitars. "Eternity" is sinister in the way the best horror stories are scary; by hinting at a malevolent danger while keeping it in the shadows, it becomes up to the listener (or viewer or reader) to imagine what is unseen. "The Tracks of the Hunted" is the first true metal song on The Tracks of the Hunted, and it's a doozy, reminiscent of Ghost Reveries-era Opeth in the way it drenches its death metal riffs in the atmosphere created elsewhere on the album, and maintaining and elevating that atmosphere through a completely different musical style than previously encountered on The Tracks of the Hunted. The dueling clean and harsh vocals on the song's second half serve as a fantastic compliment to the lush, progressive-tinged guitar and bass riffs that are as melodic as they are heavy. If "Piano Intro" and "Eternity" make the listeners aware of a monster in the mist, then "The Tracks of the Hunted" is the monster emerging from the gloom, a merciless hound chasing the listener across the moor. "The Tracks of the Hunted" is not only the best song on The Tracks of the Hunted, it's one of the best songs of the year. "The Sound of the Void" finds Noire shifting back to ambience, comprised entirely of bell-like tones that echo into the ether. It's a pleasantly surprising track, a song that could have felt like a throwaway interlude that instead manages to create an atmosphere of tension and anxiety that dwarfs the eeriness of Tracks of the Hunted's first two songs. "There Is Nothing Left" brings back the acoustic guitars and piano, alongside spoken word lyrics, before album closer "My Name" ups the ante considerably. "My Name" is a truly beautiful song, a funeral dirge that features lush vocal harmonies, elegant acoustic guitars, and a piano outro that brings the album back to the gothic romance of "Piano Intro." The Tracks of the Hunted is an unusual metal album, in that of its six tracks, only one could reasonably be described as metal. But that doesn't stop it from being one of the most powerful albums of the year. I mentioned Marry Shelley's Frankenstein earlier; with The Tracks of the Hunted, Noire has crafted a musical ghost story, one that is as frightening, dark, and gothically beautiful as Shelley's tale. It may not be completely metal, but The Tracks of the Hunted is sure to become a fixture on dark, autumnal evenings in my household; I suggest you give it a listen as well. The Tracks of the Hunted was self-released by Noire, and is available now.